FATE: Killed in Action, 15 August 1916, France. Sidney Joseph Cameron, born in Hamilton in 1891, was the only child of John Thomas Cameron and Honor Pitman. The family lived in Griffin Street and Sidney attended Hamilton State School and Elementary School. In 1902, when Sidney was eleven, his father passed away. After finishing his schooling, Sidney completed a three-year hairdressing apprenticeship with Mr Rogers in Hamilton. Sidney was a good cricketer, one of Hamilton’s leading players. Playing football, he was known as a skilful goal kicker and at the gun and rifle clubs, he was among the leading shooters. He was also a drummer for the Hamilton Pipe band and was a member of the Terrier Coursing Club. 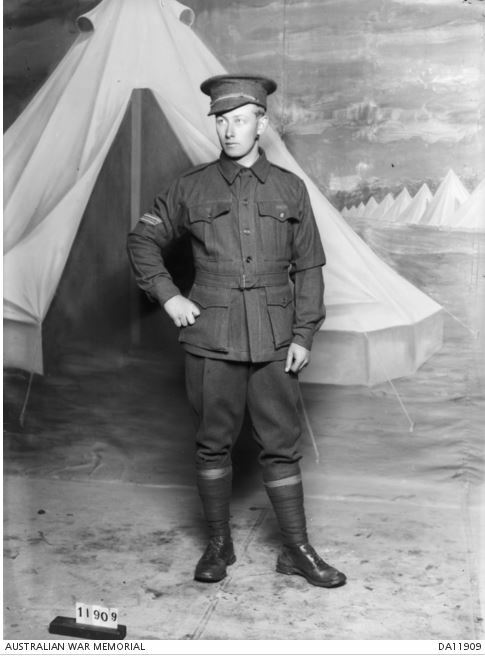 On 14 July 1915, Sidney enlisted in Hamilton and was attached to the 23rd Battalion. He left Australia on 27 October 1915 aboard HMAT A38 Ulysses. He started his service in Egypt where he celebrated Christmas 1915. He wrote home about his time there including the dwindling numbers of the group that first went into to camp in Australia on 3 August 1915. 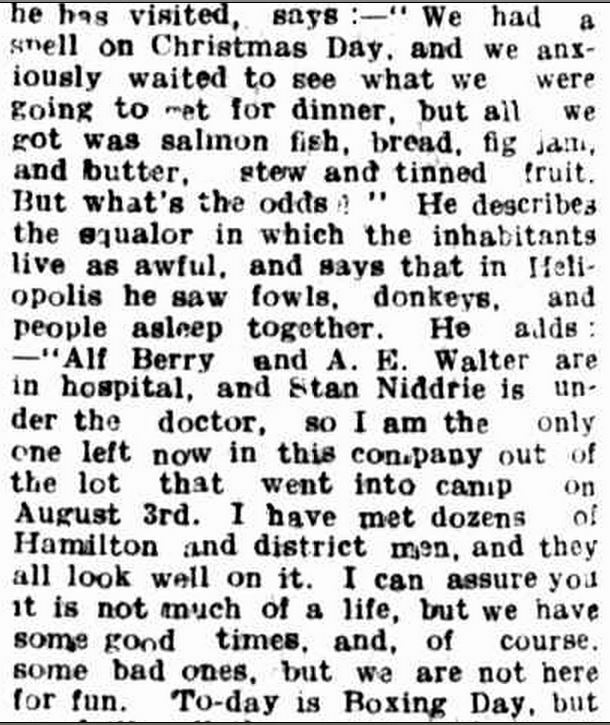 “LETTERS FROM SOLDIERS.” Hamilton Spectator (Vic. : 1870 – 1918) 17 Feb 1916: 4. <http://nla.gov.au/nla.news-article120412092&gt;. In early 1916, Sidney was transferred to the 58th Battalion and proceeded to France. By August, he was promoted to Corporal, however, only days later he was shot while manning a post near Fleurbaix, France on 15 August and died instantly. He was buried in the Rue-Du-Bois Military Cemetery, Fleurbaix, France. The Hamilton Spectator published a letter on 15 November 1916 from Hubert Eadon, the former general secretary of the Hamilton YMCA. The “Hamilton boys” would make a cross for Sidney’s grave. “WITH THE AUSTRALIANS IN FRANCE.” Hamilton Spectator (Vic. : 1870 – 1918) 15 Nov 1916: 4. .
Hubert Eadon was killed a month after the letter was published. Sidney’s mother Honor was sent a letter from Battalion Chaplin Sergeant Brimwell. In Hamilton, Sidney’s name was added to the Elementary School Honour Roll, the Hamilton War Memorial and a tree was planted in his honour along Hamilton’s Anzac Avenue.